This retractable brush came from a markdown bin at Bath & Body Works. It is called Beautiful By Nature and I snagged three or four of them. Who could resist a $4 brush? Not the cavewoman. I brought them home and set them aside in a drawer. I didn't really need them and didn't know what to do with them. And then, I bought a laptop computer. A week or so after I bought the computer, I noticed that the screen was getting a bit dusty. Now how in the world can you clean a flat computer screen? You dig into your brush stash. The B&BW retractable brush is my computer-screen-cleaning brush. I've since given away the rest of my B&BW retractable powder brushes to my friends with flat-screen monitors. 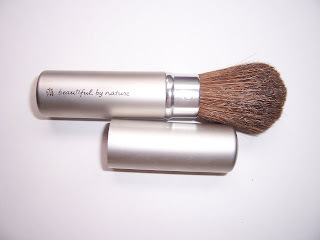 Have you ever used a makeup brush for a non-makeup purchase? Now is the time for True Confessions! Disclaimer: This product was purchased by the reviewer, Cavewoman. I use the retractable brush that comes with Clinique's loose powder to dust my laptop. Okay, I think it is now time for you to stop buying brushes. Good idea, tho! Have you counted how many you have? On second thought, maybe you shouldn't! I have loved the posts! I used a tiny travel eyeliner brush to edge the inch-wide strip between my kitchen window trim and cabinets. Worked like a charm! hilarious. I love it... and it's a great idea! There is a much more useful purpose than a clean computer. Let's just say that I found this blog after i googled the term "makeup brush masturbation."